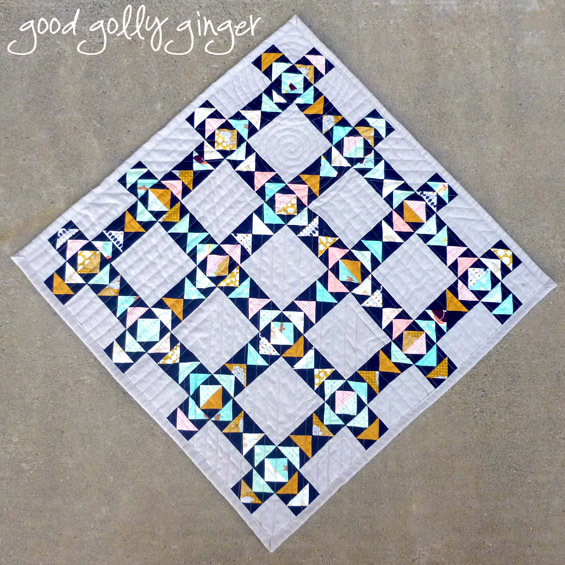 In my last post, someone commented that surely this mini quilt was a gaggle of geese. For sure! I used this pattern from Fat Quarter Shop. My intention was to quilt many spirals on this quilt. They were not going well, and it was frankly too slow to make a spiral. So I stopped that, and I quilted radiating straight lines from the spiral. I'm still not happy with the finished quilting, but it is done. And done is better than nothing. Right? I used Essex Linen in Flax for the background, Kona Cotton in Nightfall, and various Art Gallery prints. On the back, I used Athena and Wild & Free patterns by Art Gallery. I do love the backing of this. Each flying geese block measures 1" x 2", and my quilt finishes at 24" square (the pattern has extra sashing that I didn't add). Don't forget, I have a giveaway going on now! The giveaway, sponsored by the Fat Quarter Shop, is open through next Tuesday, March 31, 5 PM PDT. I think the quilting works well... the spirals are a bit like the sun and the lines are the migration pattern following the seasons and sun. Congratulations on the finish! Thanks for posting sizes of blocks and the quilt. The quilting pattern for a quilt is always the hardest for me. I like your combo of straight lines and spirals. I really like how the colors of the geese sparkle in your quilt. From far they remind me of opal. Before I read what you wrote about the quilting, I thought it looked like the sun with rays going out it. It lends another layer of interest to the quilt. I'm glad you gave the sizes of the geese so we can truly appreciate the small scale. Every finish is a great finish! I love this...the pattern, the contrast, the colors, the size! 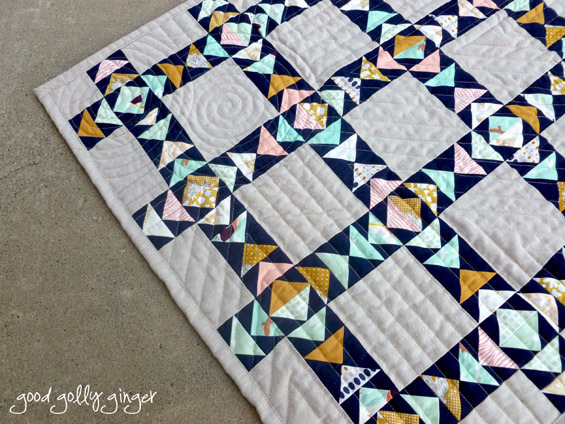 Girl, it looks gorgeous, including the quilting! The Art Gallery fabrics with the essex linen looks really great, nice color palette. 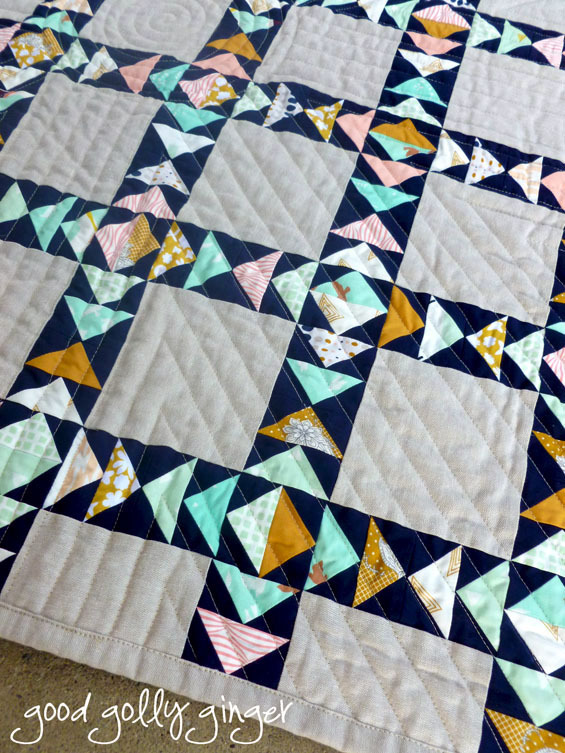 Beautiful work, love your fabric color combo the triangles just pop off the quilt top. 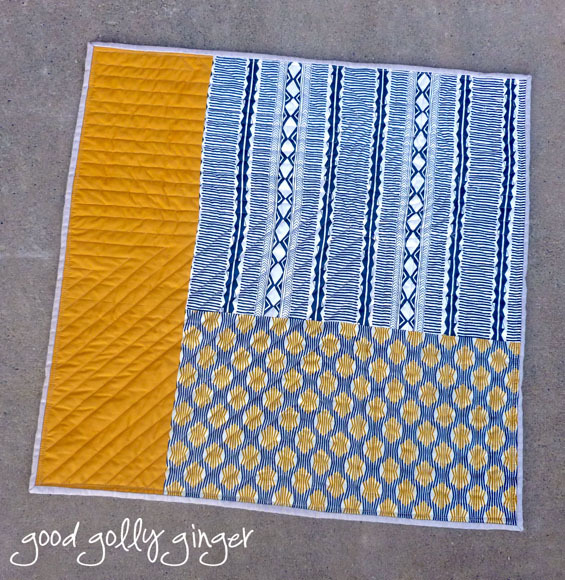 Quilting looks perfect!